Focuses on user responsibilities & safe operations. Issues certificate immediately upon completion. Anyone operating an aerial lift or mobile elevating work platform (MEWP) must be trained according to OHS requirements and provincial/territorial regulations. This course will instruct users in the basic operation, safety practices, hazard assessment, and inspection requirements of aerial lifts and MEWPS including boom and scissor lifts. Once certified in this course, users will be eligible to complete practical training on aerial lifts. From there, users must be familiarized and demonstrate their competence with their assigned MEWP before operating it on the job site. Viktor F. Verified Buyer Excellent training programs, I will be sure to use this website for any and all other training programs. Jenn S. Verified Buyer No issues at all. Staff was very helpful when I emailed for assistance. Palvinder A Verified Buyer Great service, easy to understand and get your license. 10 out of 10 . Christopher W. Verified Buyer [E]xcellent, will use you guys for other courses. Miltiadis L. Verified Buyer Clicking on all the tips and clues, made it stick. Good course for the patient people! Printable certificate is issued immediately upon completion. Wallet-sized plastic certificates are also available. Training can be completed in approximately an hour and a half. Work at your own pace. There is no time limit. Live student support is available 7 days/week via phone, email, or live chat. Individual training and bulk user management tools make coordinating multiple users quick and simple. Immediately upon the successful completion of the Aerial Lifts & Mobile Elevating Work Platform exam, a digital certificate will be issued. This certificate can be downloaded from your account and printed at your convenience. Sign your certificate. There is room on the back of the certificate to document your practical training along with make/model of the aerial lifts or MEWPs that you are authorized to operate. A sturdy plastic Aerial Lift and Mobile Elevating Work Platform (MEWP) Training certificate may also be purchased directly from the My Account page. These physical certificates are printed on durable 0.30mm polycarbonate plastic. Your record of training will be stored securely in your account for a minimum of five years should you need to reference it or provide proof of training. The record includes training details and completion date. Add, modify and remove as many users as you require. View training records, print certificates, and report on user progress. Distribution of training programs and the creation of user accounts can also be automated through the use of enrolment codes. Track certification status for your users including issue dates, completion status, and upcoming renewals. The certification management tools also allow you to create and assign custom certifications for third party courses, on-site practical training, or previously completed training. Track all of your user’s training in one place at no additional cost. WHO NEEDS TO TAKE AERIAL LIFTS AND MOBILE ELEVATING WORK PLATFORM (MEWP) TRAINING? Anyone who wishes to operate an aerial lift, aerial work platform, or mobile elevating work platform (MEWP) needs to be certified in the theory and practice of safe operations and be familiarized with the particular equipment they will be using at their work site. The Go Safety course aims to train users in the safe operation of aerial lifts, and MEWPs including scissor lifts and boom lifts. ONCE I COMPLETE THE AERIAL LIFTS AND MOBILE ELEVATING WORK PLATFORM TRAINING, AM I QUALIFIED TO OPERATE THIS EQUIPMENT? No. You have only completed the first half of the qualification process. You need to be familiarized in the practical operation of each aerial lift or aerial work platform you operate. Familiarization must be completed by a qualified person who will ensure you understand the vehicles’ controls and its safety devices. You will then need to demonstrate that you can operate the machinery safely and responsibly before your employer authorizes you to use them on your worksite. NOTE: You will need to be familiarized with EACH MODEL of aerial lift or aerial work platform assigned to you before you can operate them on a worksite. WHAT TOPICS ARE COVERED IN THE AERIAL LIFTS AND MOBILE ELEVATING WORK PLATFORM COURSE? The differences between scissor lifts and boom lifts. Responsibilities involved in the safe operation of a variety of lifts. Hazard assessment and injury prevention. How to maintain stability and prevent your lift from tipping. How to perform visual and operational inspections of your equipment. The need for fall protection. FOR HOW LONG IS MY AERIAL LIFTS & AERIAL WORK PLATFORM CERTIFICATION VALID? Your certification from Go Safety is valid for five years. However, you may be required to recertify sooner depending on provincial/territorial legislation or your company’s health and safety policies. You will also be required to go through familiarization training if you are given a new MEWP to operate. You may also be required to recertify or retrain on your lift if there is a worksite accident, even if you weren’t at fault. HOW LONG WILL IT TAKE FOR ME TO COMPLETE THE AERIAL LIFTS & AERIAL WORK PLATFORM TRAINING? Most students complete the course in about 90 minutes, but there is no time limit to finish your training. You can pause the program and pick up where you left off later. Once completed, the training material will continue to be accessible to you for review purposes. You can write the exam multiple times until you achieve the passing grade of 80%. WILL THE AERIAL LIFTS & MOBILE ELEVATING WORK PLATFORM TRAINING PROGRAM WORK ON MY TABLET OR SMARTPHONE? Yes! Go Safety’s training program has been developed to work on all major operating systems and web browsers. Your training may be taken on a personal computer/laptop, as well as most tablets and mobile phones. When you begin or continue your training on a mobile device, the website/application controls, and the interface will automatically adjust for your screen size and optimize the controls for your device. WHAT IF MY INTERNET CONNECTION IS UNRELIABLE? In the event of an interruption due to loss of connectivity, your training will be paused. You may resume your studies at any time by logging back into your account on any compatible device with an internet connection. 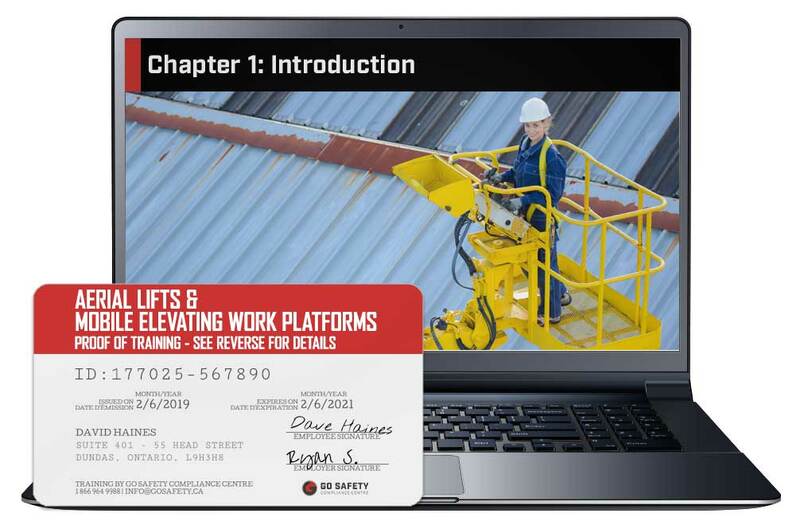 HOW CAN I ACCESS MY AERIAL LIFTS & MOBILE ELEVATING WORK PLATFORM RECORD OF TRAINING? Your record of training is made available from your user account. This record is maintained by Go Safety for a minimum of five years and is available at any time. HOW CAN I PURCHASE AN AERIAL LIFTS TRAINING WALLET CARD? 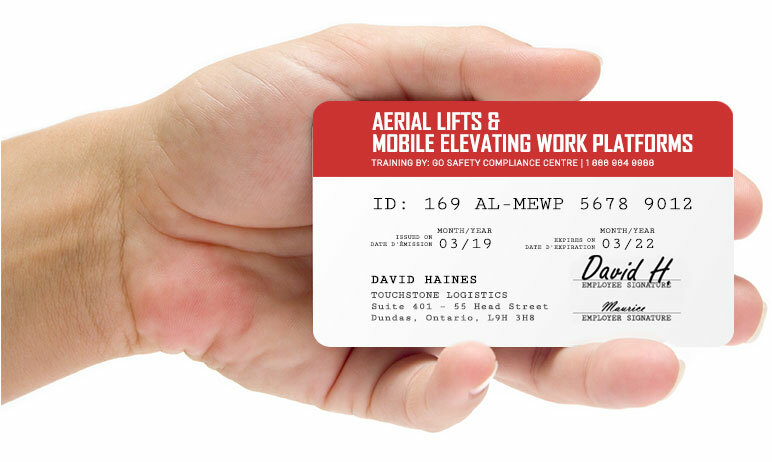 You can now purchase a wallet card version of your Aerial Lifts Training certificate online. Log into your account, go to Certifications, click then the green order button to the left of the certificate list. Select the course you would like to purchase the wallet card for and follow the prompts. WHAT HAPPENS IF I LOSE MY AERIAL LIFTS & MOBILE ELEVATING WORK PLATFORM TRAINING CERTIFICATE? If you lose your certificate, you can download and print a replacement copy from your account at no cost. If you would like a plastic hard copy replacement delivered via mail or courier, you can order one directly from Go Safety with a small charge to cover the cost of postage, printing, and fulfillment. CAN I PURCHASE AERIAL LIFTS & MOBILE ELEVATING PLATFORM TRAINING FOR SOMEONE ELSE? Training can be purchased for others, including workers, students, and friends. Simply purchase the course and then assign it to a new user account after the transaction is complete using the Manage User panel. User accounts for other people can be created one at a time, in bulk, or through an automated system using training access codes. These codes will automatically assign training to another user as well as assign their account to you. This will allow you to report on their training progress and certification status from the Manage Users panel. Have a Question? Ask an Expert. Catherine M. Verified Buyer Helpful knowledgeable staff, very pleased with the support. Mahmud H. Verified Buyer Well designed courses, online or physical. Garett S. Verified Buyer Thorough WHMIS training; recommended! Mark Anthony B. Verified Buyer Very professional and very explanatory. Would definitely recommend. Chuck H. Verified Buyer Just completed your online TDG course, very informative and easy to use. Thank you! Frederick B. Verified Buyer Course was very well set up and user friendly. Daniel L. Verified Buyer The course was very clear. I was able to maneuver through it easily. The layout and operation of the course all made a lot of sense. Alan D. Verified Buyer Site was easy to manage. Information was current and informative.